Role-playing an anxious daughter by the bedside of her sick mother, senior nursing major Esther Ghale participated in a simulated patient interaction with two peers and a vomiting mannikin in the newly renovated Lisa Haverstick Simulation Lab at Eastern Mennonite University. Professor Laura Yoder (front, from left) de-briefs with senior nursing majors Haley Kuehle, Emma Millar and Esther Ghale. Professor Melody Cash listens at far left. The audience included nursing alumni, some fresh from shifts at area hospitals, and other supporters and donors. Thus the hushed silence as they watched the very human drama around the hospital bed, in which patient, relatives and nurses all try to gather and filter information, make clinical decisions, process anxiety and build relationships. The afternoon simulation, part of a continuing education program facilitated by Professors Melody Cash and Laura Yoder, showcased the lab’s new space and equipment. An early evening reception and dedication ceremony attended by approximately 60 alumni, donors and other supporters followed. 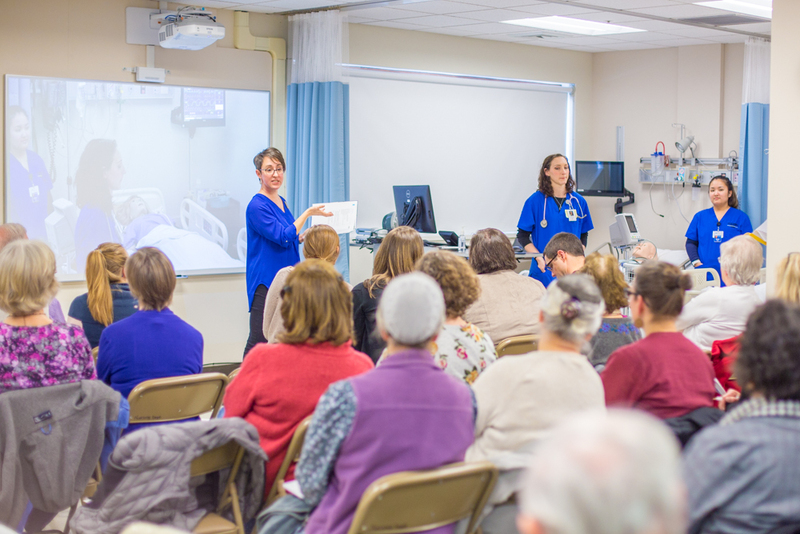 The afternoon simulation, part of a continuing education program for nurses, showcased the lab’s new space and equipment. An early evening reception and dedication ceremony attended by approximately 60 alumni, donors and other supporters followed. Emily Augsburger ’18, Michael Sumner ’15 and his wife Debra visit with EMU nursing professor Audrey Myers in the lab. More than $224,000 has been raised to support the lab expansion, which added more than 1,100 square feet of space. 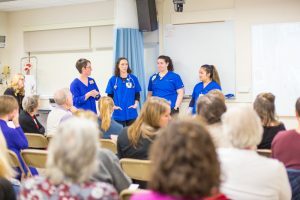 Several more beds and simulation equipment have enabled an increase in the annual number of nursing graduates from 48 to 64. 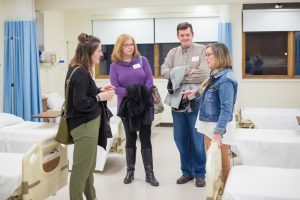 Alumni joining in the celebration represented the camaraderie and deep ties among the nursing department, from a 40-year veteran to several more recent grads. Reba Showalter Brunk ‘76 runs the New Moms Ask a Nurse support group at Sentara RMH Medical Center. Madelyn Arbaugh ‘13 and Michael Sumner ‘15 were just two of EMU’s many DAISY honorees working at Sentara RMH. Also present was Harold E. Huber, husband of Vida J. Huber ‘61, who chaired EMU’s nursing department from 1967-84 and was instrumental in the development and growth of the program. Emeritus professor Herb Swartz honored his late wife, Margaret, also a nurse, with his presence. 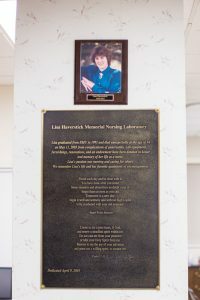 A plaque in the lab memorializes nursing alumna Lisa Haverstick. The lab is named in honor of Lisa Haverstick, a 1991 alumnus who worked at Lancaster General Hospital and at Medical Associates of Lancaster in Pennsylvania until her death from pancreatitis in 2004. The original lab space and equipment was funded through a combination of donations from her family and friends and a grant from Anthem Blue Cross and Blue Shield. The Lisa Haverstick Endowment Fund was also established to provide critical support for equipment replacement in the future.